This rich blend is designed with the active person in mind. A combination of oils to help your body heal, reducing aches and pains. that is good for the whole system. The nourishing qualities of vitamin E, is the primary medicine associated with this oil. Regular use of wheat germ oil promotes beautiful healthy skin and helps scars to heal. The oils antioxidant activity seems to eliminate free radicals at a cellular level. Castor oil has been found to help heal muscle and joint injuries. Its healing potential was documented and popularized by Edgar Cayce. He suggested using the oil with penetrating heat to harmonize lymph tissue damage. Conventionally known as St. John's Wort this remarkable herb serves a multitude of healing purposes and is especially valued for it's deep healing of skin, nerve, & tissue damage. St. Joan is a powerful ally for those with sciatica, leg & foot cramps, neckaches, arthritis, and offers prompt and long-lasting relief from pain. St. Joan's wort is also widely recognized as an antidepressant. Long known as the most versatile of the essential oils, lavender relieves aching joints and deep tissue pain. The essential oils extracted from this wonderful plant are also excellent for burns. Member of the Melaluca family, this oil is known for inducing muscle-relaxation. 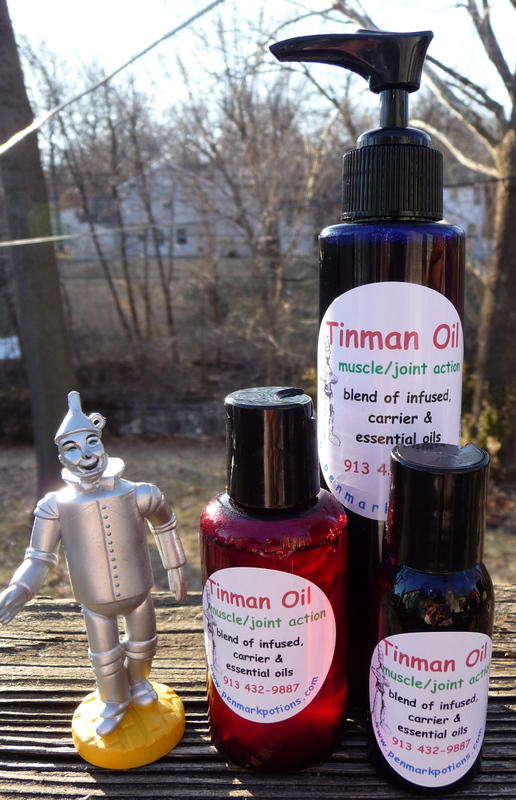 Tinman Oil is a premium blend. The thick viscosity of the Castor Oil will create heat with a vigorous rub. Penetrating heat drives the medicinal blend deep into aching joints and into sore muscles for relief of pain. Fluidity is enhanced. The lymph tissue is delicately invigorated by the oils; the healing process is stimulated. Like the Tinman, our joints may get creaky and stiff. Nourishing the physical body with this special blend seems to enhance mobility by reducing pain, facilitating repair, and restoring heart to the user.